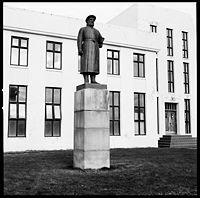 A statue of Snorri Sturluson by Norwegian sculptor Gustav Vigeland was erected at Reykholt in 1947. Snorri Sturluson (1178 – September 23, 1241) was an Icelandic historian, poet, and politician, considered to be one of the most important poets in Icelandic literature. He is known today as the author of two lengthy verse works, or eddas, the Prose Edda and the Heimskringla. In the Prose Edda, an instructional poem of great value to scholars, Sturluson recounts a number of stories out of Norse mythology while explicating on the verse-forms and literary techniques utilized in each of the myths he recounts. The Heimskringla is a more traditional sequence of semi-mythological sagas relating the history of the Norse kings. Sturluson is also believed, through stylistic and linguistic evidence, to be the author of Egils Saga, one of the most important and widely-read of all the Icelandic sagas. As an author of poetry, history, and instructional verse, Sturluson is one of the most informative sources for scholars of medieval Scandinavian history and culture. His works are also generally considered to be among the most beautiful and brilliantly-crafted of all Icelandic poetry. A major influence on the Icelandic poets of his own times, Sturluson has also influenced a number of non-Scandinavian authors, including the Argentinian poet and story-writer Jorge Luis Borges and a number of minor poets of German Romanticism. Little definitive is known of Sturluson's life, and much of what is known is subject to dispute and conjecture. Sturluson has almost become a mythological figure in his own right, nearly as mysterious as the heroes and demigods found in his poems. Nonetheless, a handful of facts are generally agreed upon. Snorri Sturluson was born in 1178. He was a distant descendant of Egill Skallagrimsson, the semi-mythical poet-warrior who is the protagonist of the Egils Saga. His parents were Sturla Þórðarson and Guðný Böðvarsdóttir. He was raised in the village of Oddi by Jon Loptsson, one of the most powerful chieftains in all of Iceland, from whom he learned much of the traditions of Icelandic culture and literature. In 1199, Sturluson married. His marriage made him a wealthy man, and by 1206, he and his wife had settled in Reykjaholt. The remains of his farm, including his hot outdoor bath, have been preserved to some extent. He was said to have had many children, but only five are said to have survived to adulthood. It would be in Reykjaholt that Sturluson would compose almost all of his poetry. He quickly became known as a poet, but was also a successful lawyer. Eventually, he would serve as lawspeaker at the Althing, the Icelandic parliament. As lawspeaker, Sturluson was one of the most important politicians in Iceland. In the summer of 1218, Snorri sailed from Iceland to Norway, by royal invitation. There, he became well-acquainted with King Hákon Hákonarson, meeting a number of great Norweigan thinkers and poets who would influence his eddas. In the summer of 1219, he met his Swedish colleague, the lawspeaker Eskil Magnusson and his wife, Kristina Nilsdotter Blake, in Skara. They were both related to royalty and may have given Snorri insight into the history of Sweden. 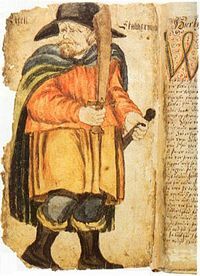 Snorri became involved in an unsuccessful rebellion against Hákon Hákonarson, which resulted in his assassination in his house at Reykjaholt in 1241, by Gizurr Þorvaldsson, an agent of the king. Snorri's last words were reportedly Eigi skal höggva!—"Don't strike!" As an historian and mythographer, Snorri is remarkable for proposing the theory (in the Prose Edda) that mythological gods began as human warlords and kings whose funereal sites developed cults of worship. As people called upon the dead warlord as they went into battle or faced hardship, they began to venerate the figure as more than just a man. Eventually, the king or warrior, Sturluson argues, would be remembered only as a god. This theory about the evolution and development of polytheistic religions is strikingly modern, and it is extraordinary that Sturluson, a poet living hundreds of years before the advent of modern anthropology, would have the intellectual resources and historical knowledge to be able to articulate such a radical idea. Sturluson also proposed that as tribes would explain their history in religious terms, arguing that, for instance, when one tribe conquered another they would view it in terms of their gods conquering the opposing tribe's gods. Today, Sturluson's works are read by scholars of medieval Scandinavia due to the wealth of historical information found in them. In addition, Sturluson's Old Norse, while quite different from contemporary Icelandic, is still readable by most Icelandic speakers, and as a result Sturluson's works are still an important part of the Icelandic literary curriculum. Moreover, a number of poets of diverse backgrounds have been attracted to the terseness of Icelandic poetry, and Sturluson is often seen as the pinnacle of the period. Between the Prose Edda, with its invaluable details on the art of Old Norse verse, the Heimskringla, with its rollicking stories of adventurer-kings, and Egils Saga, which is universally considered one of the greatest of all the Icelandic sagas, Sturluson is an author of many virtues, who offers insight and excitement to readers of all backgrounds and disciplines. This colourful front page of the Prose Edda in an 18th century Icelandic manuscript shows Odin, Heimdallr, Sleipnir and other figures from Norse mythology. 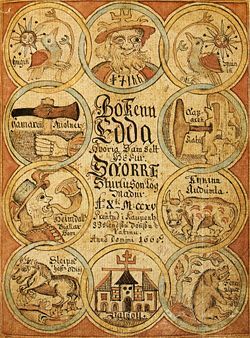 The Prose Edda, known also as the Younger Edda or Snorri's Edda, is an Icelandic manual of poetics which contains many stories from Norse mythology. Its purpose was to enable Icelandic poets and readers to understand the subtleties of alliterative verse, and to grasp the meaning behind the many kennings, or repertory metaphors, that were used in skaldic poetry. The work was written by Sturluson around 1220. Seven manuscripts, dating from around 1300 to around 1600, have independent textual value. The Prose Edda opens with a Prologue and consists of three distinct books: The Gylfaginning (c. 20,000 words), the Skáldskaparmál (c. 50,000 words) and the Háttatal (c. 20,000 words). Gylfaginning, or the Tricking of Gylfi, is the first part of the Prose Edda, and is the most conventional in form. Generally, the Gylfaginning has been seen by scholars as an example of Icelandic poetry, which readers of the subsequent, instructional sections of the Prose Edda can refer back to in order to better understand how Icelandic poetry is made. As a story, the Gylfaginning deals with the creation and destruction of the world of the Norse gods, and many other aspects of Norse mythology. In particular, the Gylfaginning deals with King Gylfi's encounters with the Æsir, or spirits, and his disguised journey as Gangleri to Asgard, the heaven of the Norse gods. There Gylfi is ostensibly exposed to the glories of Asgard and its inhabitants. The whole of this narrative is metaphysical since the Æsir trick Gylfi into believing in the arcane complexities of the Norse pantheon without believing in it themselves. It can be argued that Snorri used this narrative device as a means to safely document a vanishing and largely pagan oral tradition within a Christian context. The second part of the Prose Edda is the Skáldskaparmál or "language of poetry." This part of the poem consists of a dialogue between the Norse god of the sea, Ægir, and Bragi, the god of poetry, in which both Norse mythology and discourse on the nature of poetry are intertwined. The origin of a number of kennings are given and Bragi then delivers a systematic list of kennings for various people, places and things. Bragi then goes on to discuss poetic language in some detail, in particular heiti, the concept of poetical words which utilize a synecdochal technique. Synecdoche is the substition of the part for the whole, or vice versa. For example, the poet might use the word "steed" instead of "horse," and Bragi again systematizes these. In so doing, the Skáldskaparmál becomes a veritable thesaurus of Norse poetry. The Háttatal is the last section of the Prose Edda, and possibly the most important. Using, for the most part, his own compositions, Sturluson provides examples of the types of verse-forms used in Old Norse poetry. Although Sturluson systematized Norse poetry, he often notes that "the older poets didn't always" follow his rules. Most of the forms Sturluson explicates are written in syllabic meters, which is to say they depend on the number of syllables per line. Much of Norse poetry, Sturluson notes, was alliterative, meaning that assonance, consonance, and alliteration were more important than rhyme. Although end-rhyme is represented, it does not function in the ways most other forms of European poetry do, and in general rhyme plays a very minor role. Many scholars have suggested that the form of Hattatal suggests a classical influence deriving from the traditions of Christian learning to which Sturluson was doubtlessly exposed. Others have argued that this is a result of using a logical approach, within the framework of a dialog, and that some aspects of the work prove that it was not directly influenced by classical writings. Regardless of whether Sturluson was familiar with the great Roman instructional poets such as Horace and Ovid, his work is of equal importance to the classics for scholars attempting to read and comprehend the poetry of medieval Scandinavia. Egils Saga is an epic Icelandic saga, generally attributed to Sturluson and generally considered his masterpiece. It is estimated that he may have written the work between the years 1220 and 1240 C.E. Egils saga is an important representative of the Icelandic sagas and has much to say about the end of the Viking era. The saga is centered on the life of Egill Skallagrímsson, an Icelandic farmer, viking, and skald poet. The saga covers a long period of time, starting in Norway in 850 C.E., with the life of Egil's grandfather Úlfr, called Kveldúlfr ("Evening Wolf") and his two sons, Þórólfr, a great warrior who had a complicated relationship with King Haraldr of Norway, and Egil's father Skallagrímur Kveldúlfsson ("Bald Mask, son of Night Wolf"). After Þórólfr's death, due to his broken allegiance to King Haraldr (although not Þórólfr's fault), Skalla-Grímr and his father Kveldúlfr flee Norway to settle in Iceland. Skalla-Grímr settles in peace as a farmer and blacksmith at Borg, where his sons Egil and Þórólfr (named after his uncle) grow up. The story continues with the childhood of Egil, which foreshadows his future rebelliousness. His family's peace is again lost as the social order is threatened by Egil's dangerous attitude. He stirs up trouble with his first murder with an axe at the age of seven. The story goes on to tell the tales of Egil's voyages to Scandinavia and England, his fights and friendships, his relationship with his family (highlighted by his jealousy, as well as fondness for his older brother Þórólfr), his old age, and the fate of his own son Þorsteinn (who was baptized once Christianity came to Iceland) and his children who had many children of their own. The saga ends around the year 1000 C.E. and spans many generations. The saga follows Egil through the various stages of his life, most of which are surrounded by battle, and Egil virtually narrates his own life story with his frequent segments of poetry. As a work of literature, Egils Saga is generally considered to be amongst the best of the Icelandic sagas, along with Njáls saga and the Laxdæla saga. Like other Icelandic sagas, it is written in alliterative verse, uses elaborate and at times riddling metaphors while always maintaining a concise narrative style. Sturluson is generally considered to have mastered, more than any other Icelandic poet, the typically curt and swift style of Icelandic sagas. The saga is additionally praised because of its accuracy; although written some time after Iceland was converted to Christianity, Sturluson was able to preserve, tastefully, the history and culture of the pre-Christian Icelandic peoples, providing an invaluable point of view to historians of the period. Faulkes, Anthony. The sources of Skáldskaparmál: Snorri's intellectual background. In Snorri Sturluson. Kolloquium anläßlich der 750. Wiederkehr seines Todestages. Tübingen: Narr. Retrieved February 4, 2008. Fortean Times. Snorri's Hot Tub. Retrieved February 4, 2008.